Falstaff is a high-density community owned and operated by the Toronto Community Housing Corporation (TCHC). In 2009, the TCHC was the IwB’s major project partner. The IwB students and staff were looking at the revitalization of the TCHC’s aging housing stock, primarily the Flemingdon Park neighbourhood. TCHC was also investigating many of its other high and low-rise buildings around the city. Falstaff was one of these properties that like Flemingdon Park was in need of major infrastructural redevelopment. The community also faced many social issues, in particular high incidents of crime. The Falstaff Charrette was conducted November 6-9, 2009, by the IwB in partnership with the TCHC, to propose improvements to the architectural, landscape, and urban design components of the community as well as address the social issues facing the neighbourhood. Engage community to create better accessibility between buildings and increase visibility to promote a safe environment. The goal of the Falstaff Charrette was to develop ideas that can contribute to the future revitalization of the site by addressing several key challenges, including: site access, safety, infrastructure and landscape improvements, community engagement and participation as well as funding and budgetary issues. Teams were encouraged to think through the needs of diverse stakeholders of Falstaff and create design proposals with the greatest impact on the community. The Toronto Community Housing Corporation (TCHC) is the largest landlord in Toronto, with more than 58,500 low and moderate-income residences in high, mid and low-rise buildings as well as townhouses and houses across the GTA. TCHC residents include seniors, singles and families, many of whom are refugees and new immigrants to Canada. Several of the TCHC properties have aging infrastructure problems that create difficulties for operational costs. Most of the sites also have antiquated designs that are impractical and non-sustainable, for instance large landscaped areas that are expensive to maintain and fail to meet the needs of the residents. The Falstaff Community faces these issues and others. It is a high-density community located at Jane St. and Highway 401 in Etobicoke. The site consists of three 20-storey towers of 669 units, surrounded by a gardenlike landscape. To date some renewal has taken place. The lobbies in all three towers have been renovated, but the remaining public spaces are in need of repair and improvements. Added to the architectural and landscape design problems are diverse cultural and language challenges. Part of the problem relates to language barriers, but also cultural differences between people of different ethnic backgrounds and also people of different generations; cultural gaps between grandparents, parents, and children are common. Residents are also highly concerned with security and safety. Parents are often not comfortable with youth leaving the apartments for outside community events and programming for fear of violence in the neighbourhood. Some of the fear stems from past shootings in the community. 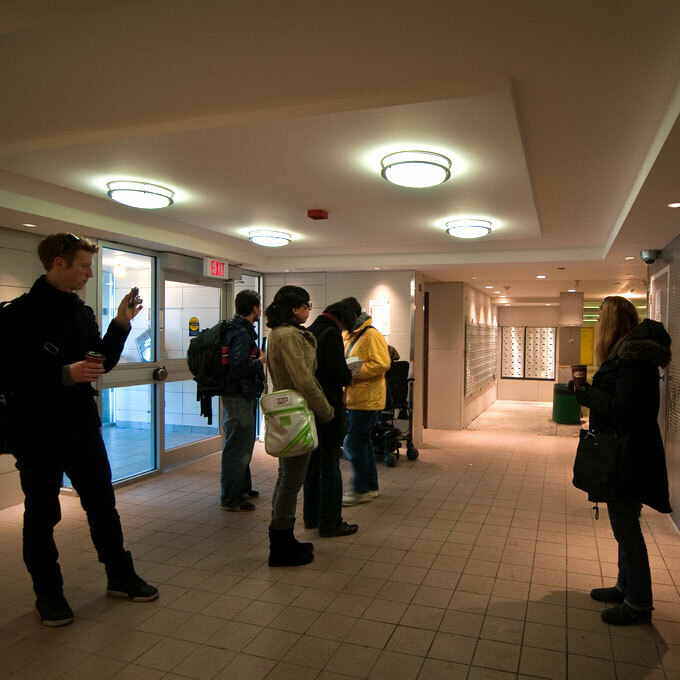 Thus, even though the Falstaff complex includes amenities and public spaces, many spaces are underused by residents because of residents’ perception of lack of safety. The issues in the community are serious, but so is the dedication of the many community members to improving the facility and the neighbourhood. Falstaff has a vibrant network of residents, who are principal drivers of change in the community. On the whole, the charrette looked at ways to create a more livable environment that will help improve the health and safety of the community, develop sustainable solutions that will reduce the ecological impact of public spaces within the site and reduce upkeep costs aw well as establish an attractive site that will foster a sense of ownership for the residents. 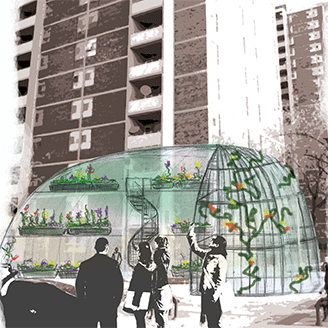 The teams proposed many different ideas including: phased and affordable approaches with multiple self-sustaining models; construction and maintenance that is integrated with training and employment programs; the development of new components such as commercial activities like markets, a greenhouse, educational and leisure programs and spaces; as well as the possibility of ownership to stimulate better community engagement. The emphasis was placed on expanding the reach of the community beyond the boundaries of the buildings, transforming the facility by connecting environmental and social aspects of the spaces. Other project ideas that were proposed confronted maintenance issues such as graffiti, exposed wires, water damage and instances of crumbling infrastructure like the entrance canopies, as well as increasing vehicular and pedestrian access in areas that are not efficiently used. Security on the site was another major issue looked at by the teams. In view of poor sight lines, a lack of lighting, and numerous insecure exits, teams looked at ways to increase physical lighting and community awareness as well as the general use of the spaces to keep traffic high and promote ‘eyes on the street’. 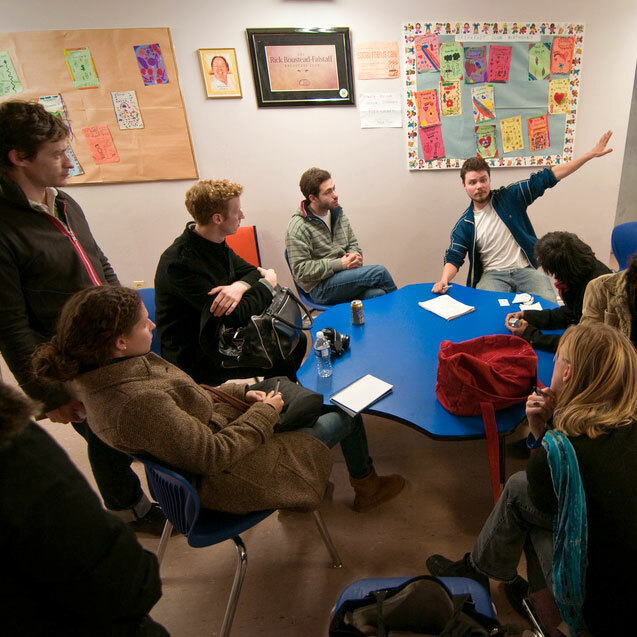 Several teams addressed developing the capacity of the Community Centre and other public spaces for use by all the residents, but in particular for youth and seniors; seniors living at Falstaff are often isolated from the community and require some interior common spaces that do not require going outside in the winter. In these spaces, many of the charrette teams envisioned more educational programming and activities that could work to bridge the generational and ethnic differences between residents. The charrette was an opportunity to envision how Falstaff’s vibrant community could be leveraged to create change and new opportunities for residents. It showed that even small creative improvements could cause a domino effect in the community. Though Falstaff has not undergone significant revitalization yet, the charrette helped to imagine practical solutions for future implementation.